If you test the first version of Maverick (v 0.05) you’ll soon find out it cannot mate at fast time controls with rook and king vs. a lone king. Quite shocking! Despite gnawing its way through 9 million positions per second, the mate is too deep for an engine without hash tables. So it just pushes its king and rook around the board aimlessly. Obviously it needs help. I could add a few “if-then” statements to handle these cases. This would work well if there are only a few standard endgame. But I’d like to create a scalable solution where I can add all sorts of knowledge. I posted a questions on the Computer Chess Club and Steven Edwards pointed me in the rights direction – material hash tables. Material hash work like this. 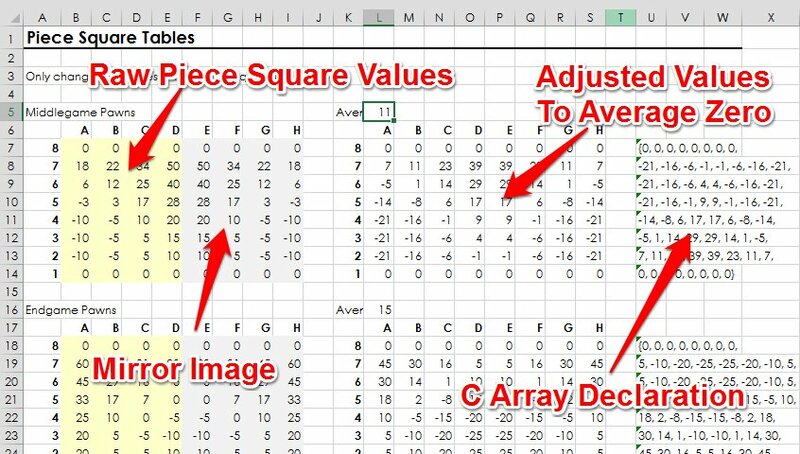 Each position has a material hash value which is calculated based on the number of each type of pieces on the board. So when a piece us added or taken away the material hash value is updated. Unlike a normal zobrist hash value the location of the piece is not relevant. Time to Create the Search Routines! I had planned to have a reasonably solid evaluation function in Maverick from “day 1”. It looks as if I’ll need to backtrack a little. I had imagined I’d put all of the gubbins of the evaluation function (e.g. attack tables) in the “board” structure. However, the drawback to this approach is the need to store changes as moves are made and unmade on the board. For example, if I generate all of the attack tables when I evaluate the position I’d subsequently like to use this information in my Late-Move-Reduction code. However, if I include the attack tables in the board structure I’ll need to store and retrieve it as part of the make / unmake process. This sounds expensive! What I intend to do is to have a “ply_data” array which stores information about the current position at any give ply. This is not unusual and Monarch has this structure. As an example, it enable us to see what move was played two moves ago. So I’ll move some of the information I was planning to store in the board structure, including the attack tables, over to this ply_data array. This is a fundamental structural issue. It concerned me that as I push ahead with the evaluation I may need to make structural changes later when I put the search routines in place. So I’ve also decided to freeze the evaluation function in it’s curent basic state and create the search routines (i.e. make Maverick play chess). I have the structure of the evaluation function in place so (hopefully) I’ll be able to develop it quickly I have a basic search. http://www.chessprogramming.net/wp-content/uploads/2015/05/ChessProgramming-Logo-20151-300x138.png 0 0 Steve Maughan http://www.chessprogramming.net/wp-content/uploads/2015/05/ChessProgramming-Logo-20151-300x138.png Steve Maughan2013-06-15 12:09:112013-06-15 12:09:11Time to Create the Search Routines! I’ve been thinking about Piece-Square tables. They’re not the most exciting part of computer chess but they seem quite important (based on Ed Schroder’s experiments), so I thought I’d put some time into thinking about reasonable values. I’ve created a simple spreadsheet in Excel to help create them. You can download it here (Piece-Square-Tables.xlsx). It assumes your board representation starts with A1 = 0 and H8 = 63. Enter the values in the yellow squares on the left. The gray squares are the mirror image of the yellow squares. The table in the middle is adjusted to make the average table value zero. This means if I set the value of a bishop to be 350 centi-pawns and put it on a random square, the value returned by the Piece Square Table will average out to 350 centi-pawns. The idea is to minimize interaction with other evaluation terms. The column to the far right is the table formatted as a “C” array. You can copy and paste this code. Is a Lazy Eval a Good Thing? Lazy evaluation is a technique often used to save time when evaluating chess position. If a position’s true score is much higher than beta or lower than alpha the full evaluation is really unnecessary. For example, if you’re a queen down it’s a waste of time checking to see if you have a weak double pawn on a4. So in the right situation this approach can save a lot of time and speed up an engine. Of course there is the risk that the lazy evaluation is way-off and the position is incorrectly evaluated. The technique was quite popular in the 80’s (and probably the 90’s). Ed Shoeder noted it gave him an enormous speed increase in Rebel. I’ve been giving the issue some thought and I’ve come to the conclusion I will not add a lazy evaluation in Maverick. My reason is simple – I’d like the leaf nodes to be evaluated as accurately as possible. My hunch is that by evaluating the leaf nodes as accurately as possible I’ll be able to be more selective in positions closer to the root (which will dramatically reduce the tree size). This type of decision is part of the design philosophy of Maverick. I also suspect the lazy evaluation technique is less relevant in modern programs which use null move and late-move-reduction. Back in the 80’s there was still a battle between the Spracklen’s brute force approach and Lang’s selective search. In those days it was common to only evaluate at the leaf nodes (i.e. not evaluate the interior nodes). In this situation the leaf nodes evaluation could have a wide range of values, some much higher than beta and others much lower than alpha. So lazy evaluation worked well. In contrast null move and late-move-reduction have the effect of keeping the search tree closer to alpha and beta. Null move reductions are good at quickly weeding out obvious fail high moves (i.e. very good positions) and late-move-reductions reduce the tree size for obvious fail low positions (i.e. very bad position). So by utilizing these techniques lazy evaluation becomes less relevant and more risky. Of course this is just theory – let’s see how it works in practice. What are your thoughts on Lazy Evaluation? http://www.chessprogramming.net/wp-content/uploads/2015/05/ChessProgramming-Logo-20151-300x138.png 0 0 Steve Maughan http://www.chessprogramming.net/wp-content/uploads/2015/05/ChessProgramming-Logo-20151-300x138.png Steve Maughan2013-05-17 09:06:422013-05-17 09:06:42Is a Lazy Eval a Good Thing?